I left school at fifteen to work at Engart Fans, on the Hirwaun Industrial Estate, as an apprentice mechanical engineer. I hated the job and it hated me – I lasted a year. I applied for an electrician’s apprenticeship at Aberaman Colliery and failed the medical. I was offered an apprenticeship at the local coke works, the Phurnacite Plant. I turned it down because I’d heard horrendous stories of the conditions there. I was a fool. I then worked at a glove factory, again on the Hirwaun Industrial Estate. I forget what it was called but I remember the women teasing me something chronic. In those days I was a pretty little boy! I didn’t last long there either, a few weeks at most. The Inland Revenue offices in Llanishen in Cardiff were graced with my presence next. I worked there for all of four months. At a loose end, and having heard the stories my older brother came home with, I decided to enlist in the Royal Navy. I was a radio operator for just over two years. I departed when I got a compassionate discharge, the reason being my father, living on his own, had just had a heart attack. Between you, me and the gatepost that was just an excuse. I hated the toffee-nosed, so-called upper classes looking down their noses at me. So, I thought I’d prove them correct and leave them to it. The Phurnacite at last got their hands on me. I was there for fifteen years and qualified in doing most jobs. But I was mainly a press operator. I was elected union representative for about eight or nine years and was on the Lodge Committee throughout Scargill’s abortive strike. God, I hated that man. Led by the nose by Maggie Thatcher, he shattered the best union in the world, devastated the justifiably proud organization built up by a far better man, Joe Gormley. I took voluntary redundancy because my daughter, Helen, had been diagnosed with cancer and given just a year to live. My next job was a clean one. Assistant Personnel Officer responsible for health and safety at a company supplying employment training funded by the government. St J’s Training and Management Consultancy, a grand name which belittled the name of Saint John and the Church in Merthyr Tydfil. I lost count of the number of people we failed on that scheme. I was there for five years before the chairman, Canon Bill Morgan, lost the contract and we were taken over by Link Training. Link did a far better job and we didn’t fail as many as St J’s. Because of downsizing here I asked to be made redundant, again after five years, and I went to work for Frank Thompson at Aberaman Employment Training Company. I lasted five years before quarrelling with Frank and went to another training company, The People Business, in Barry. Responsible for customized training I was that successful I completed the contract with ELWa in eighteen months and found myself redundant again. By this time I was fifty-four and decided enough was enough and retired. One problem, though. I am crippled with arthritis and having no worthwhile job I used to sit at the kitchen table reading. My body seized up. I did complete a correspondence course in proofreading expecting editors to fall at my feet. It didn’t take me long to realize that I was back to dreaming. So, I enrolled on a creative writing course. I’m still doing this although I never submit anything. But I got the bug – the big one for writing. Nevertheless, to make ends meet – and to unstick my spine – I took a job as a security guard at the local abattoir and meat-packing factory. I’m still there seven years later, despite quarrelling with my boss, usually on a weekly basis. But he does put up with me as I’m the oldest and nearly everyone calls me grandpa. 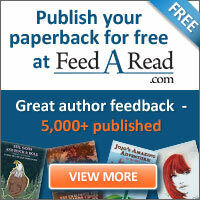 It took me six years before YouWriteOn.com, funded by the Arts Council of England, published my first novel. I self-published it on Kindle. Humorous! I’m social bookmarking a person website pertaining to long term utilize. The design for your website is a bit off in Epiphany. Even So I like your blog. I may have to install a “normal” browser just to enjoy it. Thanks for the marvelous posting! I actually enjoyed reading it, you can be a great author.I will make sure to bookmark your blog and will eventually come back very soon. I want to encourage you to continue your great work, have a nice afternoon! This topic normally is hard to talk about but you definitely sound like you know what’s up. It really is nice to definitely turn up a web site in which the blogger is intelligent. Thanks for creating your internet site. I had fun understanding this post. I want to see more on this subject.. Gives Thanks for writing this respectable article.. Anyway, I’m going to sign to your rss and I wish you write great articles again soon. Cheers, glad someone likes it.